As a grass related to citronella, it may be easy to overlook the numerous benefits and uses of vetiver essential oil. It has been used to help prevent soil erosion, but its uses go beyond what the plant can do for the landscape. Its sedative properties may be what you’re looking for to help with anxiety or focus. There are many causes of decreased libido, such as many medications or even as an effect of stress. Vetiver can be used to decrease stress and thus relieve performance anxieties in the bedroom. Combine with ylang-ylang and lavender and diffuse in your bedroom before you and your partner are ready to sleep. You should feel relaxed and be able to enjoy your time together. Pre-menstrual symptoms can interfere with daily living, due to a variety of symptoms that often differ from month to month. One common symptom can be increased stress and muscle pains. With its sedative benefits, it can help relax muscles and balance the amount of cortisol in the body during that time of the month. Vetiver has long been used in traditional Indian and Asian medicine for treating anxiety. Studies have shown a marked sedative effect on mice and a reduction in anxiety symptoms was noted. Inhalation of vetiver in aromatherapy may have nearly the same effect as some medicinal sedatives. It may be useful as an addition to traditional anxiety therapies. I don’t know anyone who isn’t inundated with too many things to do and not nearly enough time to get it all done. If it isn’t trying to balance work and things that need doing around the house, it’s playing chauffeur to the children. I feel like I’m being pulled in a million different directions and never get to complete any tasks. When I read about vetiver being used for children with attention issues, I felt it certainly couldn’t hurt with my being able to focus at home and work. I was already using rosemary and eucalyptus, which worked wonders with remembering that I still had work to do, but I still had issues focusing on one task long enough to get it done. Adding vetiver to my diffuser mix has not only calmed my mind enough to enable me to finish what I start, but I can feel the tension just drain from my body. It is like what I feel when using lavender but not as strongly, so it is a better addition to relieving stress. I’ve also found that my children are a little calmer around the house when they get a chance to inhale some of the vetiver mixes. Having children who are calmer and more focused is definitely a bonus and helps to further reduce the stress I feel every day. As always, using a therapeutic grade of essential oil is the best way to prevent any side effects such as skin irritations. This grade of oil would be suitable for ingestion and may mix well with many different types of oils to create an ideal mix for relaxation. Vetiver is gentle enough to be used as a massage as well as in aromatherapy. When diffused in a room, antibacterial properties will help kill any airborne germs, leaving you relaxed and your home healthier. Anything that can freshen my house and use more natural ingredients is always welcome. 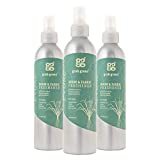 This spray can be used in the air and on furniture such as couches and beds. Since vetiver is antibacterial, it can kill the germs that cause odors on fabrics, giving them a refreshing smell between washes. It may also help manage any airborne bacteria, helping to keep your home healthy without harsh chemicals like bleach or alcohol. Women who are pregnant or nursing should not use vetiver as it may have an abortive effect. The effect on children and babies is unknown. 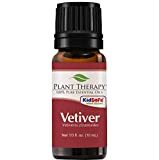 Always use therapeutic grade vetiver oil if taking by mouth. Take in low dosages when ingesting to prevent side effects. May cause marked drowsiness if used in conjunction with sedatives. Use with caution if taking medicines for anxiety as it may increase the sedative effects. Though it may not be the most common essential oil when you think of focus and relaxation, vetiver can be a powerful scent to have around. Please be sure to share this information with anyone who is looking to reduce some stress in their lives and are ready to focus on getting things done. Like any other Mom, Catherine would do anything to keep her children happy and healthy. As the chief editor of Wellness Aromas, Catherine has made it her life mission to help people access Essential Oils practice.